Good Morning Everyone. Welcome to the next HobbyHammer review, this week I bring you NAGASH! All caps all the time. 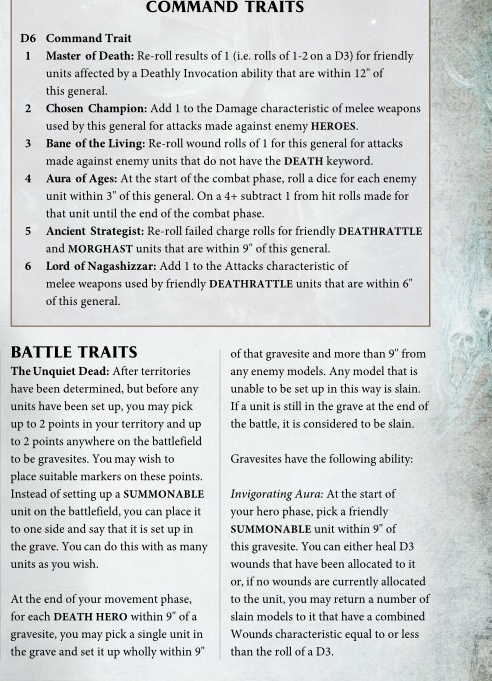 I have been digesting the battletome over the weekend and jeez.. it is a monster. The sheer amount of options you get with this is unprecedented. I shall go over that more in soon enough. 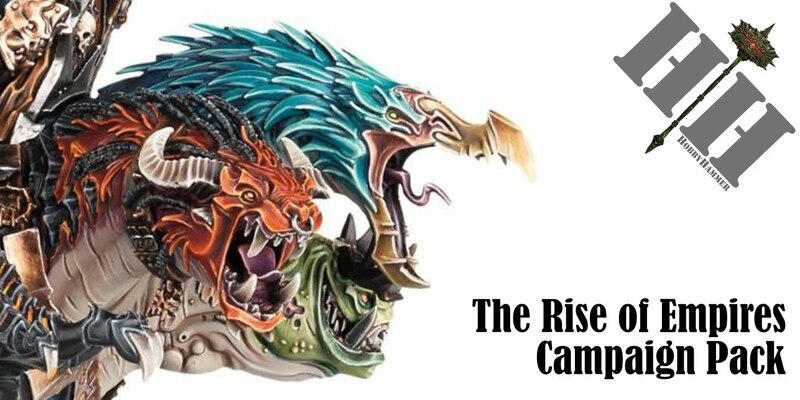 I am going to bring you a slightly different angle in this review, looking at the hobby side of the tome and the narrative aspects contained in the book as well. I hope you enjoy. The lore begin as every good story should, with NAGASH. 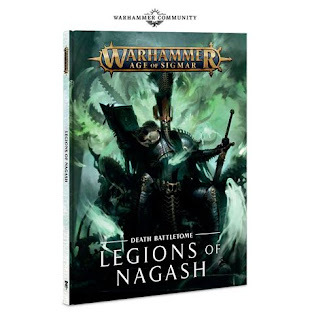 In this section it really goes to depths of the Rise and many falls of the Lord himself, NAGASH is a patient being, it reminds you of this on pretty much every page. 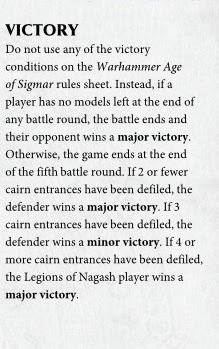 It starts with how Sigmar found him in a weakened start during the Age of Myth and as he needed someone to help run the Realm of Shyish, he bought him back to existence (smart move...), for thousands of years, the two gods held an uneasy alliance until, of course Chaos broke out and Nagash betrayed Sigmar, fleeing back to Shyish, he was followed by Archaon and the Everchosen slapped him down. 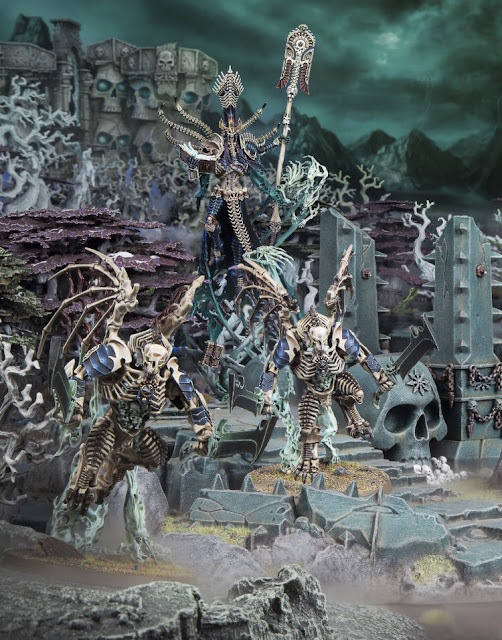 Nagash waited, and waited, slowly building up his strength again in hiding in the Underworlds of Shyish, his Mortachs done his dirty work sending minions to the outer reaches of the realm to harvest the magical sands as this helped NAGASH grown. 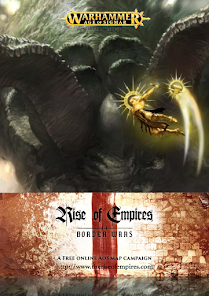 It wasn't until he found out about Sigmars betrayal (The stealing and reforging of souls into Stormcast) that he begun taking form and becoming the God we all know and love now. With this background and the Malign Portents you can really see the Darkness AoS in starting to explore. It is fantastically written and I for one can't wait to read some of the inevitable surrounding novels for this. Probably my favourite section of the Lore is the parts about the missing Chaos god Slaanesh and the missing Aelf-Kind souls and the possibilities of what is happening here. We already know Morathi and her kin are descending on the Mortal Realms soon, but it does go into some more detail about Malerion and Tyrion too, explains that Slaanesh is hidden in an unseen realm and the two Aelf gods are extracting souls, something that has annoyed NAGASH. He feels these souls belong to him and him alone. 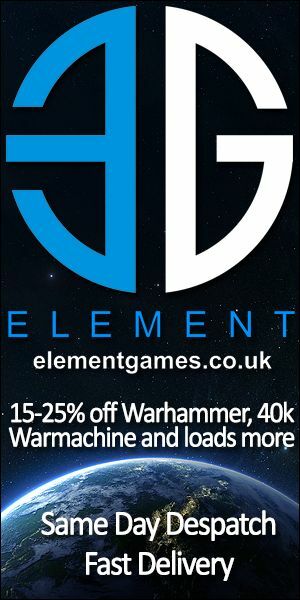 Where is Slaanesh being hidden? We don't know yet, but we do know the lore is starting o be explored here a little more. So in this book, the main named characters is key, key to the background and the way you build your army too. 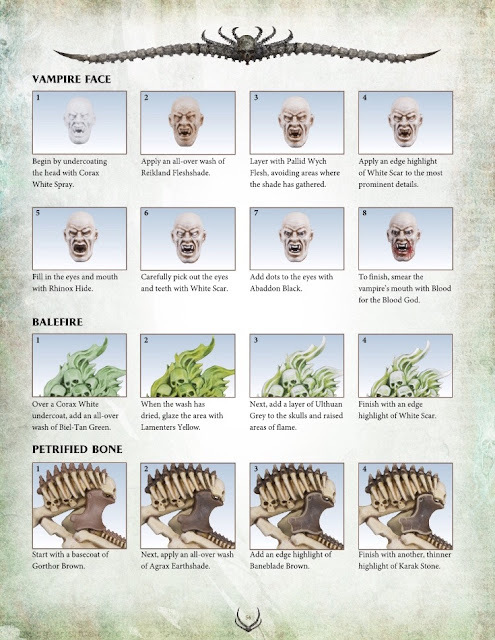 The Mortachs really are integral to this and the way you build your army links back to the unique ways the 3 characters play. The Art is beautiful as always in this book and also the army set ups they do really help you get a sense of purpose for Death. 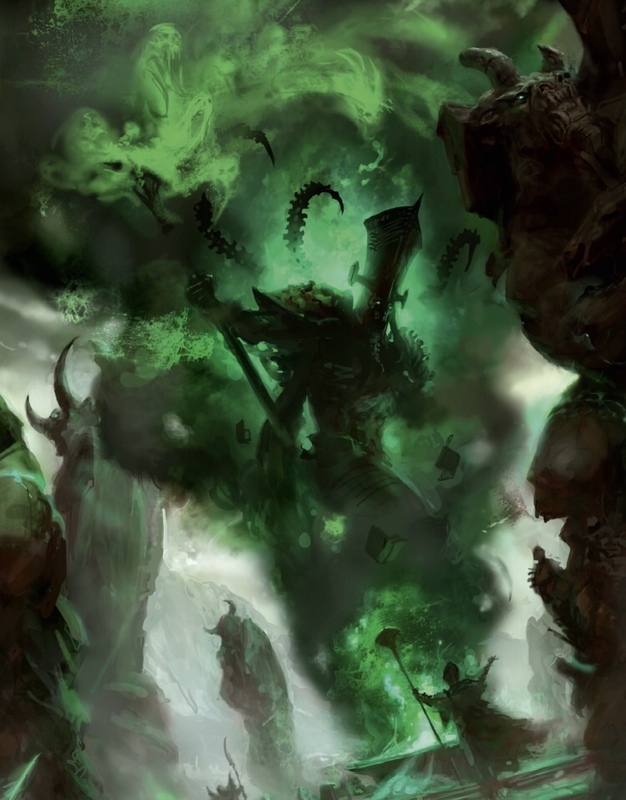 The use of scenery in the background inspires new ways of building and painting them, with Malign Portents happening now, setting up a campaign is easy and could really look amazing if you put the time in it. This is just one of the many painting tutorials you get, and they are great too. 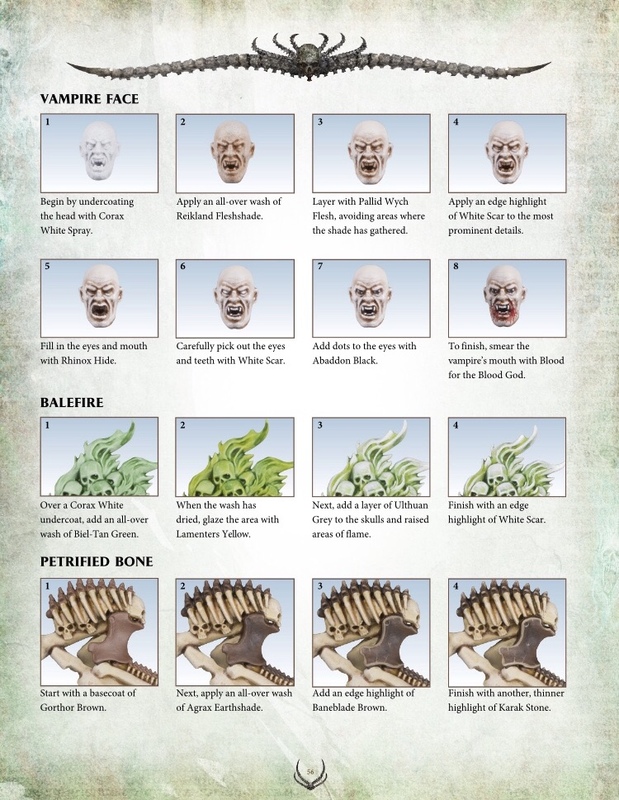 Nearly every part of how you would want to paint your army is covered, I especially love the Vampire skin one, definitely one ill be using in the future. This is by far the biggest section of the book, the options you get now are almost infinite, more than you'll ever need anyway. There is 6 different allegiance abilities to choose from depending on the style and build of your army. I won't be going over them all but I have picked out my favourites below from each set and also the unique Battle Traits you get. Unquiet Dead.. 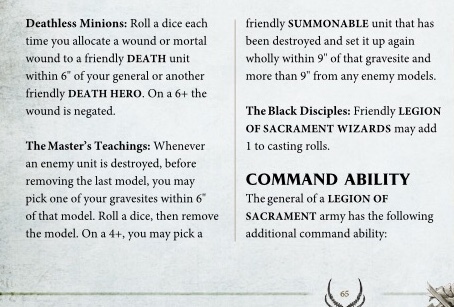 This is generic across all the new abilities, it allows you to set up Gravesites which allow you points on the battlefield to summon units with the SUMMONABLE keyword and also heal models and wounds back to your fielded units. 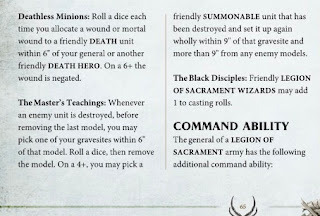 The new way GW are dealing with summoning is great and much more thematic, no longer do you need to use spells to do this, instead, just having a Hero nearby grants you access to doing so. Deathless Minions.. another generic one across them and the one you will be familiar with, basically a 6+ ward save. Chosen Guardians.. A unique one to Grand Host, gives your Morghast units +1 attack, great ability, especially for Morghast heavy armies. 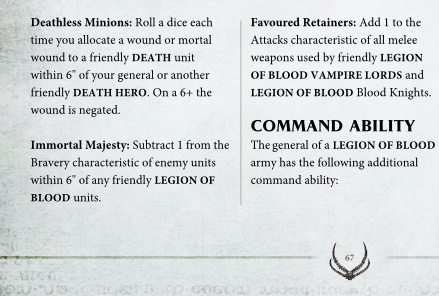 Legions Innumerable: Another way of healing your units and makes your army more resilient. You also gain access to a new Command Ability, which gives you yet another way of getting already destroyed units back onto the battlefield (of course in Matched Play, you need to set aside points for this). For Command Traits, my favourite has to be, Ancient Strategist. Great if you field Harbingers. Them 3 dice rolls and 18" charges just got more viable. Led by Arkhan the Black (if you field him, needs to be the General), you gain 2 different Battle Traits and different Command Traits and Artefacts. 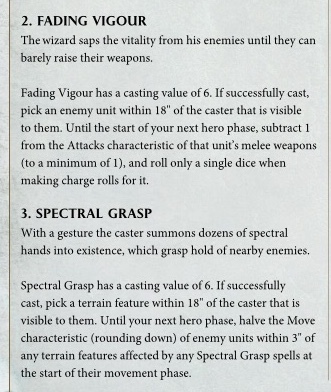 This ability is amazing as the Lore of the Dead has some really great spells, having more of them is always a plus. Masters Teaching.. gives you another way of bringing back dead models. The Black Disciples.. +1 to casting for all your Wizards. 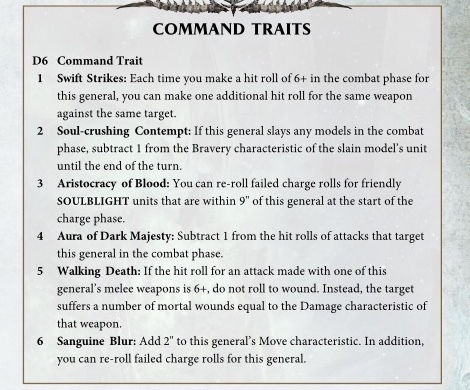 Nerfarata is the lead point here, she is great with Soulblight units, my favourite Command Ability here is Aristocracy of Blood giving you access to reroll charge rolls for Soulblight units. Running Blood Knight heavy armies, you want them in combat and especially on the charge, so anything that helps do this is a bonus. Immortal Majesty.. -1 Bravery to enemy units, simple but when you are dealing that much damage, means one more Skyfire, Brute or Stormfiend running away is huge. Favoured Retainers.. Adding +1 attack to your Blood Knights (extra chance of that D3 damage) and Lord of Zombie Dragon is really strong. You get 2 new lore's in this book, extra spells you can put on your wizards. 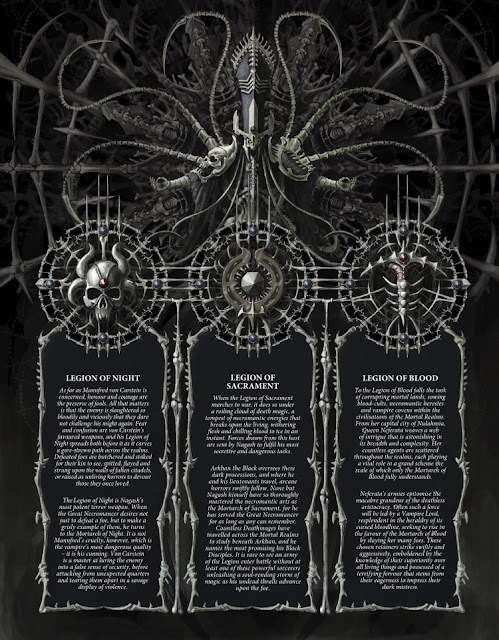 Lore of Dead is for your Wight Kings, Nagash, Necromancer etc and Lore of Vampires is for your Soulblight units. 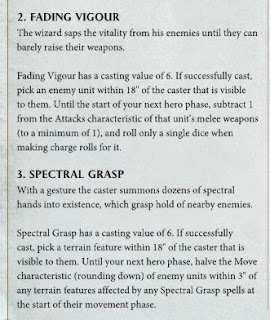 My favourites in the Lore of Dead, is Fading Vigour and Spectral Grasp. Debuffs in AoS are really strong and for this book very thematic, really makes you believe you are sapping the life from the enemy. 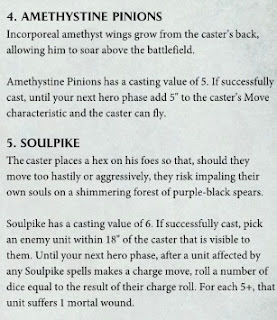 In the Lore of Vampires, these are my favourites; Amethystine Pinions cast on Mannfred or Vampire Lord on Dragon, buffed up with their respective Battle Traits and Command Traits (if allowed) makes your already hard hitting heroes even better. 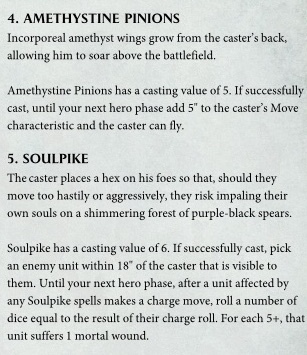 Soulspike is also great for casting on the biggest threats of your enemy. If they roll that 12 for a charge, 12 chances for Mortal Wounds! But most importantly, makes the enemy think twice on even making a charge. Again, I also want more in this section, but you do get two. Will be doing separate reviews on these once I play them, but this one below looks really fun. 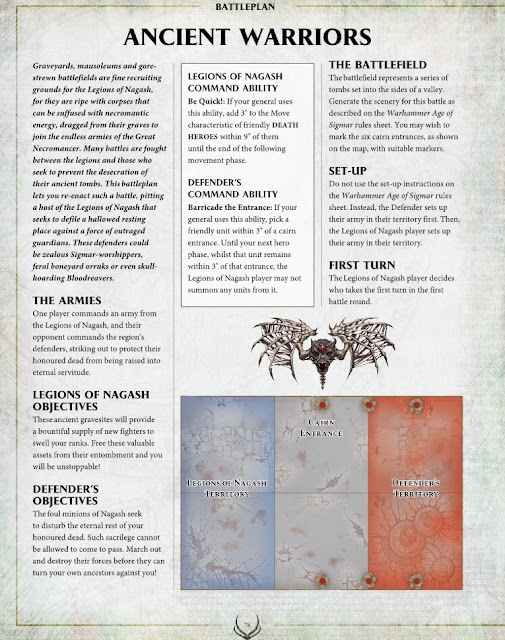 The defender must stop the Legions of Nagash from gaining access to the Gravesites, there is extra rules (not shown here), but as all these battletome battleplans do, you get a real feel for learning your new army. A whole new set of Path to Glory tables to override the supplement book last year. 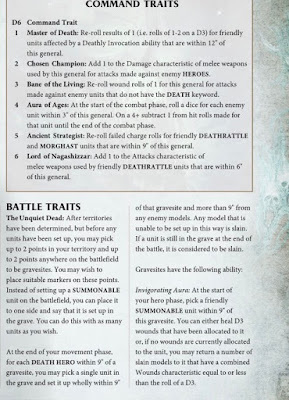 Build your own path with your Death army and build some background to a new character you create. There is so many ways this could go and I am looking forward to seeing it in action at #RoE this weekend. This shows the new way some units can be bought to the battlefield now. Zombies, Skellies, and others gain the keyword Summonable and the banner abilities is replaced by things like the above. So, even whilst writing this and having digested it over the weekend, there is still too much to really drill down into without playing the army a lot of times. 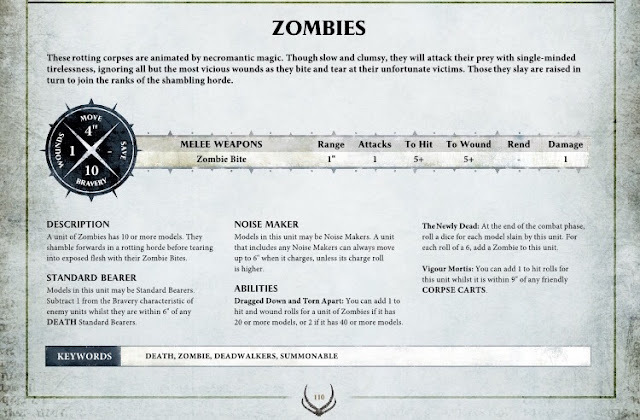 With 6 ways of building an army with new Allegiance abilities and the new Lore's of Death as well as new battalions, you get a massive arsenal of tools for both Narrative and Matched Play. A quick note of Battalions, there are a few in the book, all but one of them means you need to field a unique character which I find strange. 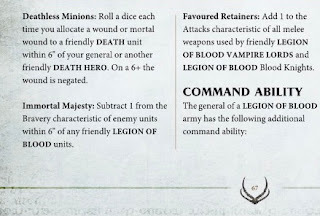 Some will not want to have to field a unique character for their battalions, especially Soulblight, I would have loved to have seen one more Battalion for Soulblight using just a regular Vampire Lord, but with the book so geared around the named characters I can see why. What are your thoughts on the book if you have it? What are most excited for?